Find yourself turning the volume on your TV louder? Find that voices are muffled and difficult to understand when you watch movies or shows? Have family starting to complain that you watch TV too loud? Find yourself falling asleep during some of your favorite programs? Wish you could hear the TV like you used to? If you answered “yes” to any of the questions above, we may have a solution that can help you hear the TV like you used to. HyperSound Clear™ 500P is a new, revolutionary home audio system specifically designed to help individuals and their families have a better television listening experience without the need for additional wearable devices. With HyperSound Clear™ you control your own volume using the HyperSound Clear™ remote while family and friends use the TV's standard volume control. HyperSound Clear™ improves sound clarity and speech intelligibility so that you can better understand what people are saying. HyperSound Clear™ is like a spotlight of customized sound focused on you, so you can hear the TV without disturbing people around you. A completely new product category. HyperSound Clear™500P technology uses ultrasound to create sound in the air itself. Proprietary electronics, digital signal processing, and unique emitter design are combined to deliver crystal clear sound to create a highly-immersive listening experience, similar to wearing headphones. 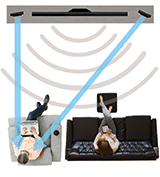 This revolutionary new method of sound delivery allows you to hear better sound where you want it, without increasing the television volume affecting others in the room.